PHOTO: Allen Ramsey, DWCPhoto.com. 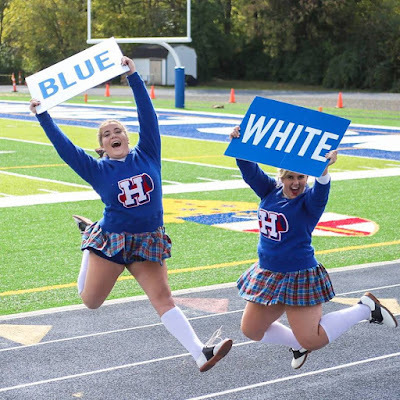 The Highlands cheerleaders showed off their signs before Saturday's game against Covington Catholic. The Bluebirds won their 14th in a row over the Colonels, 14-10. PARK HILLS - Someone associated with the Covington Catholic Colonels football team may have played Ryan Star's song, "This Could Be The Year." But even though it was not for certain until the last minute, the Highlands Bluebirds made sure it turned into another case of it not being "The Year" the Colonels break the streak with a 14-10 win on Saturday. This marked the lowest point combined point total in the series since 2004. Highlands beat the Colonels, 9-0 during the regular season that year in Fort Thomas. The Bluebirds took the driver's seat in Class 5A, District 5 action with the win in a battle of 2-5 squads. Highlands opened district play last week with a 42-7 win over Dixie Heights and Covington Catholic beat Grant County, 47-9. "All this game does is figure out where the (potential regional final) playoff game is going to be," said Brian Weinrich, Highlands Head Coach. "Highlands-CovCath is always a battle. We're fortunate enough to get the win and put ourselves in position to host that game if we can win the district next week. People who have seen us in practice know why we gritted out this win. We've had a great couple weeks of practice and are getting better and better." Highlands made it 14 straight against the Colonels dating back to 2006 and won for the 11th straight time against the arch-rivals during the regular season on their home turf. The last time Covington Catholic beat Highlands at home during the regular season came 21-16 in 1993 in Tom Duffy's last season as head coach. "The guys were flying around," said Shelby Jones, Highlands Defensive Coordinator. "When the guys make decisions to take control and ownership of it, it's contagious. Suddenly, everyone is flying around every single play no matter what. Everyone is getting to the ball and trusting their keys. We'll continue that." But the Highlands defense held up on third down and recorded three takeaways compared to no turnovers for the Bluebirds. CovCath converted on 9-of-15 for 60 percent on third down compared to 7-of-12 for 58 percent for Highlands. "We knew once we were up, we had to stop them," said Drew Bravard, Highlands junior defensive lineman. "We just had to squeeze and let the linebackers take care of the empty gaps. That was the defensive game plan. We're playing 100 times better than we were at the beginning of the season." Both teams tried grind out the clock with the running games. Covington Catholic ended up gaining 159 yards on the ground and 107 passing compared to 106 rushing and 92 passing for Highlands. But neither team saw an individual rusher go for more than 57 yards. Highlands senior Nick Kendall had 57 on 17 carries and quarterback AJ Mayer had 54 on 17 rushes for Covington Catholic. "We just battled and battled and we came out on top," said Kyle Finfrock, Highlands junior offensive lineman. "We've made a lot of progress. We started out slow but the past couple games, we've been doing really well. We've been playing together and we got after it. We're really aggressive." Mayer completed 11-of-17 passes for the Colonel passing total. Senior Cam Pitzer led CovCath with three catches for 43 yards. Highlands senior quarterback Austin Hergott was proficient when asked to throw the ball. He completed 9-of-11 passes. Mitch Cain led the Bluebirds with three catches for 33 yards and TJ Sipple had two for 24 yards. "We owe this win to the defense," Hergott said. "They played phenomenal. The offense scared the fans a little bit, but the offense came through 110 percent. I feel like we've turned things around and it's incredible." Austin Mayhew recovered a fumble in Colonel territory on CovCath's first possession. Highlands moved the ball a little before missing a field goal. CovCath moved down the field. But the Bluebirds held inside their 10 making the Colonels settle for a Matthew Kloska 21-yard field goal with 1:29 left in the quarter. After Highlands punted, CovCath moved down the field and scored. Anthony Best ran it in from four yards out and Kloska made the extra-point try with 6:55 left in the half to put the Colonels up 10-0. But the Bluebird offense responded. Hergott hit Cain and Sipple on some sideline routes to open up the running game. Junior Jared Pulsfort finished off the drive with a 5-yard score with 4:43 left in the half. CovCath moved the ball near midfield on its next possession. But the Colonels lost a lot of yards when the snap flew over Mayer's head on second down forcing CovCath to punt. Highlands ran out the clock on the second half but received the ball to start it. The Bluebirds wasted no time gaining the lead. Hergott hit Braden Posey for a nice gain down the field before Grant Murray finished off the drive with a 13-yard run up the middle to give Highlands the lead with just 10:02 left in the third. "You have to take what's there," Weinrich said. "At the same time, you have to try to keep control of the game. We may have gotten a little conservative, but they were making plays at the end. We made plays at the end." CovCath moved into Highlands territory late in the fourth. But the Bluebirds forced CovCath into a throwing situation on 3rd-and-long after Bravard recorded a tackle for a loss. Mayer's pass landed in the arms of junior defensive back Bradley Greene. He took it from inside the Highlands 10 to midfield for the huge momentum swing. "I stayed over and waited for something to come my way," Greene said. "I just took advantage of what came my way. Everything we do in practice is geared toward the game. We've done that for years. That's why we're so successful." Highlands moved the ball to the Colonel 40 forcing CovCath to start taking its timeouts. The Bluebirds punted the ball back to the Colonels. But after a draw play gained a few yards, junior Trey Bowden picked off Mayer to seal the game. Highlands will go for its 31st straight district win Friday on Senior Night against Grant County (3-5) at 7 p.m. That would mark the 19th district title in 20 years for the Bluebirds.